The Optimus 46i Coil Binding Machine offers manual punching and electric coil inserting. This machine punches a 4:1 oval hole pattern for easier coil insertion. The unit punches approximately 20 sheets at a time of 20lb paper and allows you to electrically coil bind books up to 12 '' in length and up to 25mm or approximately 210 sheets in thickness. (larger coil up to 50mm or 2'' in thickness may be inserted by hand). 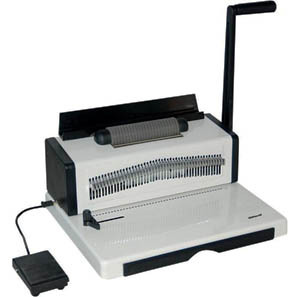 Easy to operate: Start the coil into the punched holes of the document. Place the coil against the roller, press the foot pedal and spin the coil into the document then crimp the ends of the coil. This unit has 46 disengageable dies which aids in punching odd-sized documents. Coil Crimping Pliers are included. The crimped coil aids in holding the covers and papers more securely. 46 disengageable dies great for punching odd size jobs. Copyright © 2019, Professional Binding Products, All Rights Reserved.